Today for #NHBPM – people are writing: 1) Redesign a doctor’s office or hospital room OR 2) Be mindful. Write about staying centered. “Mindful” is one of my favorite words in this whole “being healthy” process. It’s the opposite of “mindless” which is what got me into this mess in the first place. I especially love talking about being mindful when I am talking with Weight Watchers members. It’s the thing that really pulled me back when I had joined and left WW so many times. I had a favorite leader, Stan, who talked a LOT about being mindful. I sat there kind of incredulous. I couldn’t believe he was using that word! But Weight Watchers has come a long way since I first joined in 1997. It’s not just about counting points and toting up activity. Now, being Mindful is one of the key components of the program. Just last week we focused on just spending five minutes per day thinking about our health and the choices we are making. We sat there for five minutes contemplating various questions and I timed it in the meeting. I was so happy that this was our topic. And even better, this blog challenge has kept me thinking about my health for more than five minutes every day. It’s when things get so busy and we go “on automatic” that it gets slippery and difficult. It’s good to develop healthy habits so that the “automatic” we fall back on is as good as possible. But that doesn’t always happen. I truly believe that 99.9% of our health has to do with our minds – how we think about things, how we respond – to stress, to fear and worry. Which reminds me. I started attending meditation classes when I was first diagnosed with diabetes – because I was in a PANIC state, and I knew I would need to calm down the stress in my mind. I didn’t keep it up for very long, even though I loved it. I am remembering that now and I would really like to make a plan to return. On the to do list. 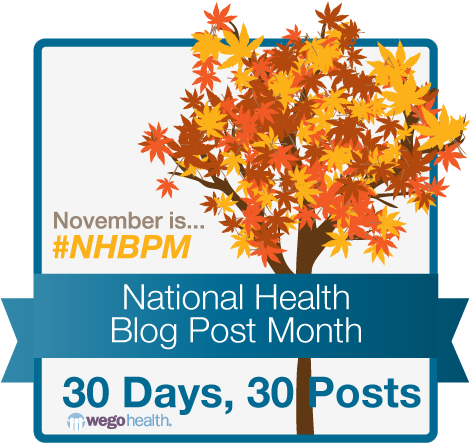 Thanks NHBPM for a full week of blogging every day – this definitely wouldn’t have happened without you! And since I’d already been thinking about it – my two cents on the doctor’s waiting room. I spent a long time in one last week and although I love my doctor, her waiting room leaves a bit to be desired. comfy chairs, please. Chaise lounges would be lovely! Especially for the family members who are waiting and don’t even go in to see the doctor. Lots and lots of fish. They are known to be calming. Classical music. Most doctor’s rooms I have been to are dead silent. Which somehow adds to the tension. A cooler of ice water with some cucumber and mint, like they have at spas. And a hot thermos of tea! Nice! A separate little post-appointment cove or nook for people to absorb new information or diagnoses/prognoses. A place that is soundproof with a nice box of Kleenex and a stuffed animal to hug. This would actually be my number one recommendation. How many times have we heard difficult or shocking news and then have had to stagger out to our car? How nice it would be to have a safe, comfortable place to just take in what we’ve heard, and maybe a friendly face to ask how we’re doing. That would be so much nicer, wouldn’t it? Here are some other bloggers to check out! Jayne redesigned a doctor’s office – great ideas. Mandy wrote a very moving post about living with epilepsy. And Amanda wrote about redesigning a hospital room. Ya gotta wonder why doctors and their staff don’t take care to provide patients with comfort in waiting rooms. You got the right idea. Implementing even some of the changes you suggest could make the patient/doctor relationship a lot smoother and could help patients cope with some difficult news at times.